Coll. No. 1837, 17 May 2018, characters observed: Perennial, to 20 cm., woody taproot; Leaves, compound, pinnate, 75 mm. × 26 mm. wide, ultimate divisions, ≤3 mm., ≤1 mm. 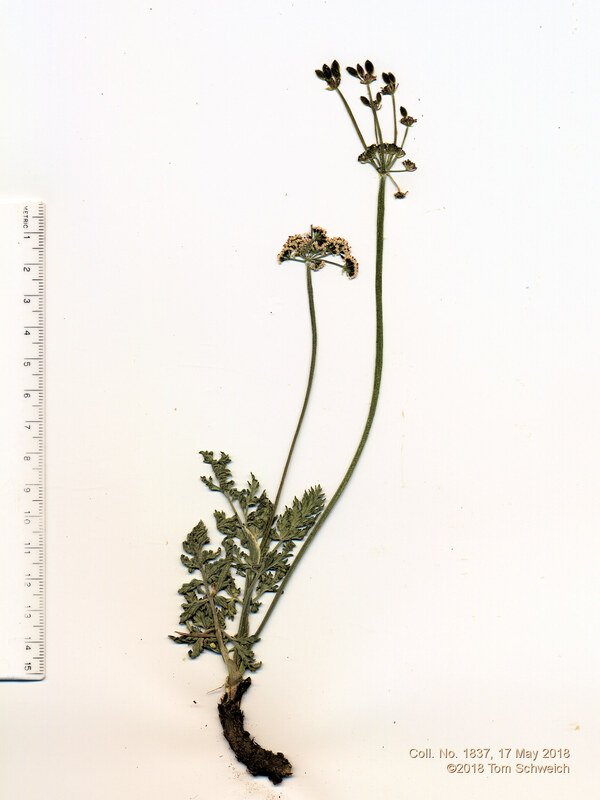 wide, villous, tips, obtuse, (with a very small white “spine”); Inflorescence, compound umbel; Involucel Bracts, glabrous; Flowers, white; Anthers, red; Ovary, glabrous, stylopodium, absent; Fruit, 5 mm. × 3.5 mm. wide, ovate, glabrous, dorsally compressed, lateral ribs winged. Field Notes: Coll. No. 1837, 17 May 2018. Other photos about Species or Apiaceae Lomatium orientale.